The micro wind turbine installation at the BHC Quad Cities campus was supported by the National Science Foundation. Wind energy comes indirectly from the sun. As the sun heats the earth’s surface, hot air rises and cool air falls. The uneven temperatures create wind. Temperature differences around the planet and the earth’s rotation also help create wind. Wind, in turn, creates energy -by lending its force to the gigantic blades of a wind turbine typically 130 to 300 feet across. Wind is powerful, especially on ocean fronts, and has the potential to create more than enough energy for the entire world. Right now, the United States is the leader in wind capacity, followed by Germany and Spain. Worldwide, there are thousands of wind turbines installed in groups called “wind farms.” Electricity is collected from individual turbines through a medium voltage collection system and transferred to the transmission grid. The transmission grid is the network that delivers electricity to the power station and to the end user – the homes and businesses served by the power company. 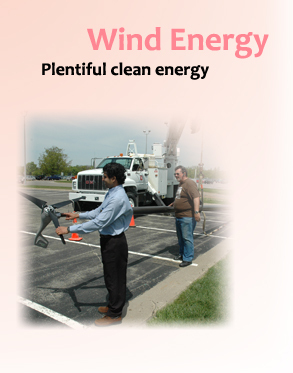 What does a wind energy technician do? 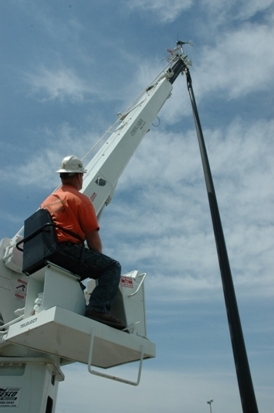 A wind energy technician troubleshoots mechanical, hydraulic, and electrical problems on variable-pitch, variable-speed turbines, helps in all areas of site operations as directed by a manager, performs all mechanical, hydraulic, and electrical component maintenance, repairs or replaces parts to correct malfunctions; and performs some diagnostic electrical analysis. The technician also documents all work performed using computer-based service reporting procedures. Wind energy technicians travel from site to site to do their work. Ability to work at significant height* on top of a wind turbine; read schematics, and understand electrical control systems is important. *Not all technicians work from the top of a wind turbine; some jobs are ground or production- room based. Wind energy production is growing very quickly. According to the American Wind Energy Association (AWEA, www.awea.org ), the amount of electricity generated from wind increased by 45 percent in 2007, and in 2008 generated enough electricity to power more than four and a half million households. Iowa is one of the states with the most energy produced from wind, making the Midwest an important area for generating wind power.